Construction of the front portion of the Muldoon Park Strip – the part we call Muldoon Town Square – began in August 2016 and is expected to be complete by fall of 2017. Phase 1 plans call for an all-inclusive playground, an ice (skating) ribbon, pavilion, bridge across the creek, a home for the Muldoon Farmers Market and more! At least two more phases are to follow to finish the park on the old Alaska Greenhouse site at DeBarr & Muldoon. The master planning process for the Muldoon Town Square Park is proceeding, and we are seeking public input. 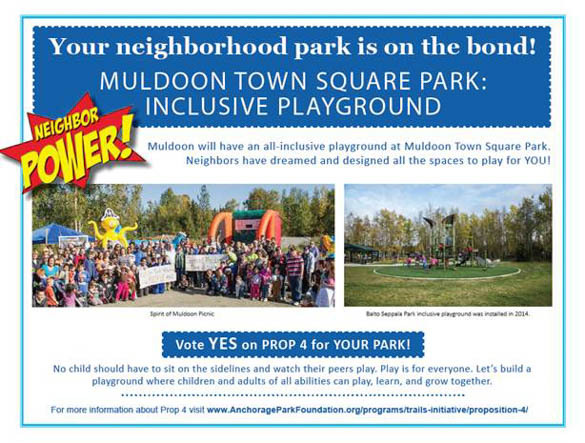 Please join us for the second Muldoon Town Square Park Open House November 4. See alternative views prepared by the planners. If you haven’t taken survey linked in post below, please do. 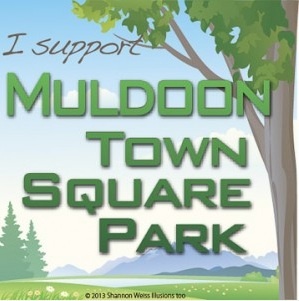 Take the Muldoon Town Square Park Master Plan Survey! Anchorage Parks & Recreation is developing a master plan for the Muldoon Town Square Park on the old Alaska Greenhouse property (SE corner Muldoon Road at DeBarr). To ensure that future improvements align with the desires of the community, we invite you to participate in a short 5 minutes survey. Survey results will be anonymous and will be used to help inform the development of the master plan.